Yesterday’s housecleaning binge took me down to the basement and into the chest freezer, and soon enough I was sidelined curing pork fatback, which is known as lardo every place without fat-phobia. I’ve been meaning to get on this one for weeks, since we’re about out of the original batch, which began curing in March. Rinse fatback in cool water and and pat dry. In a mixing bowl, combine remaining ingredients. Coat fatback with cure mixture and wrap tightly in a plastic bag, then wrap bag in a sheet of newspaper (as light will degrade the fat). Weigh with a 5-pound weight and refrigerate. Lardo is ready to use in 4 to 6 weeks, or when the fat feels firm. Adapted from Evan Mallett. I can’t wait to try this. Where can I buy the fatback? Does this need to be refrigerated while it is curing? We got 20 lbs of fatback with our half-pig, so this is part of the cook-with-the- whole-animal campaign. Another route would be to check with Heath Putnam of Wooly Pigs, who sells at the University and West Seattle farmers markets and may be able to hook you up, or other meat purveyors at the farmer’s market. Or check with your neighborhood butcher — there are a half-dozen in Seattle. And I do keep my fatback refrigerated, but those who know what they’re doing keep it going in a cool dark place. 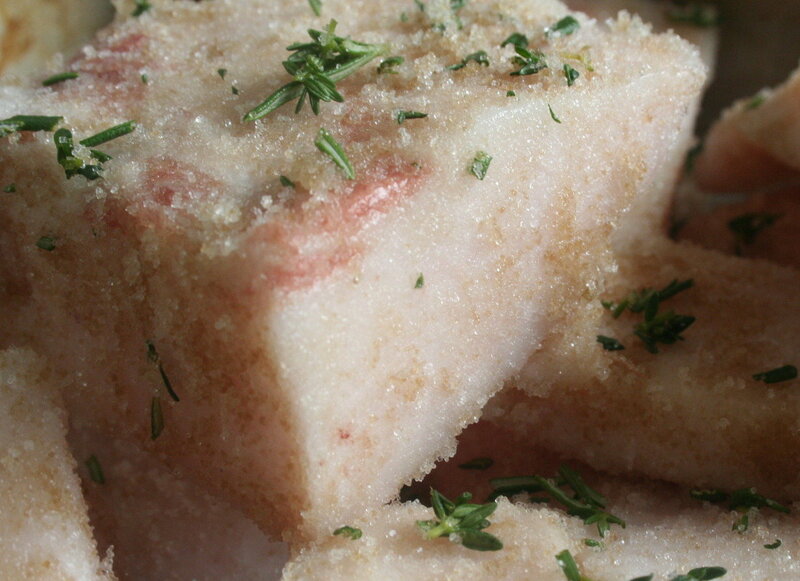 Have you brine cured your lardo also or just dry cured it? After you cure it, how long does it keep and what are the best methods for keeping it. Heath’s supposed to introduce some pure manganitsa this month. I’m sure there are already dibs on his limited supply of fatback and pork belly, but just in case I can get some, I’m contemplating a lardo cure. So far, I’ve found a brining recipe and your dry cure. Hi Greg, thanks for the comment. I’ve only dry cured lardo, as it goes in back of the fridge and a brine would take up much more space. In my experience, once the salt is rinsed off, the fat is at its best in the first three months or so then starts to taste less fresh. That said, I’ve left the salt on for months without a problem, and I’ve heard that New Englanders once kept salt pork in brine for two years. I’ll be curious to hear what works for you. Hope you’re able to get some fatback and belly. Heath’s pork is really tasty stuff. Thanks for posting this recipe. It’s been very difficult to find anything on how to cure your own lardo on the internet; I know that there are recipes in charcuterie books but in a pinch those aren’t always accessible. I’m in such a pinch as I just picked up a few pounds of fatback from my butcher. Can you tell me more about the process at the end of the 4-6 weeks? After you rinse (and I presume, dry) the lardo, how do you store it? Would it be possible to freeze it (for eating raw or for cooking)? Hi Aldous, I’ve been leaving this stuff in the salt mixture until I’m ready to use it, with the idea that the salt coating keeps other flavors out. I rinse and dry the piece I’m going to use just before I use it. It’s cured, so I don’t know if freezing adds to storage life and may add flavors you don’t want depending on how its wrapped. I’ve done this technique up to six months after the fat goes into cure but the flavors seem best in the first three months. Let me know how it works for you.